He completed his classical studies with the Pères de Sainte-Croix and in 1929 attended the School of Fine Arts where he was taught by Joseph Saint-Charles, Edwin Holgate and Charles Maillardé.In the thirties, he obtained a certain amount of success on the Montreal Art scene. In 1939 he obtained a grant from the Quebec Government to study in Paris but war erupted and Cosgrove went to New York instead. He then went to Mexico where he studied at the San Carlo Academy with the great masters Rodriguez Lozano, Jose Clement Orozco and Rivera. He then worked with the great Jose Clemente Orozco as his assistant. Upon his return to Montreal, he was named professor at the School of Fine Arts. He continued to paint and exhibit his work, namely at the Montreal Museum of Fine Arts. In 1953, he visited European museums and galleries after receiving a grant from the Canadian Arts Council. 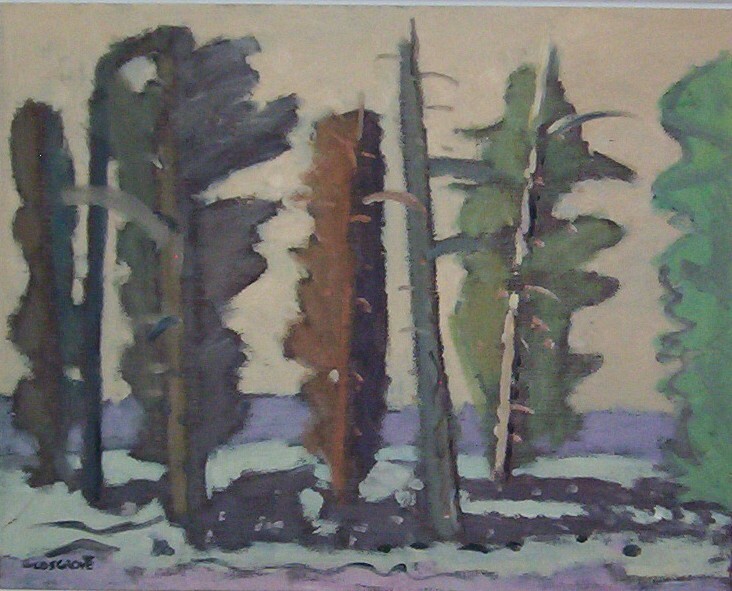 Back in Montreal, he continued teaching and then quit in 1958 in order to dedicate himself exclusively to painting. Cosgrove’s canvases represented mostly stiff life and landscapes with a few portraits and nudes. The composition quality of his landscapes was remarkable, creating both fascination and surprise. His paintings radiated mystery and poetry. This entry was posted in Biographies, Cosgrove Stanley Morel and tagged Cosgrove, galerie clarence gagnon, galerie Klinkhoff, galerie valentin, galerie vincent, Stanley Morel Cosgrove by chocolat. Bookmark the permalink.